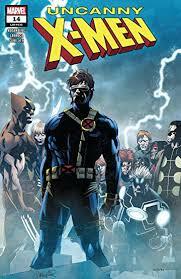 Remember when it was such a huge deal when a cover would be teasing a new member of the team? That was such a great gimmick! I’ve been appreciating Jason Aaron’s run so far as a fun, mostly lightweight throwback—and boy is he ever hitting the bullseye. The Avengers fight the vampires, as they’ve been doing, blah blah blah. And then it turns out to be a major swerve, where both the heroes and the Other Villains played into the vampires’ plans and gave them exactly what they wanted all along! In hindsight, I’m not sure this big plan actually makes sense at all, but I’m giving it as much depth of thought as it seems to ask for—as in, very little! 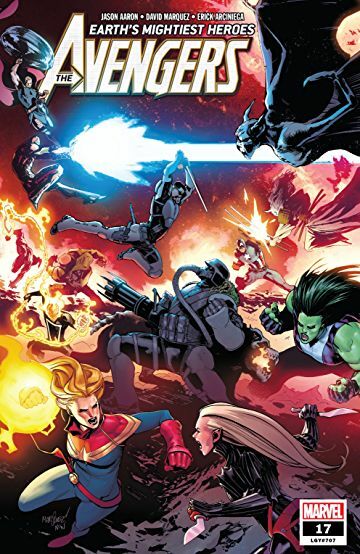 But then next issue is all about the beginning of War of the Realms, where all of the solicitations seem to be focusing on which heroes die, so this might be the end of the fun, nostalgic action. Ultimately, the vampires have declared a Russian wasteland as their new home, so at least somebody’s happy. Speaking of depositing outcasts in remote eastern European locations, that leads me to Uncanny X-Men #14. Last issue, I was also bemoaning how Uncanny X-Men seems to be straddling two nostalgia trips—the “X-Men adrift” elements of the post-Fall of the Mutants arcs of the late 80s and the excess of the Image guys’ early 90s. This issue starts with the X-Men tracking down Reaper, one of the Mutant Liberation Front baddies, who has apparently retired from evildoing. Then Dark Beast suggests he’s betraying the Marauders, which sends the X-Men on a hunt in New York—and this is where the story really loses me. Like her people have just been slaughtered presumably by the hundreds if not thousands and Callisto is just hanging out dishing out the jokes that Matthew Rosenberg has been hoarding for a while (I didn’t mention the “rose-colored glasses” line that Wolverine tossed at Cyclops recently). So then out of nowhere, the X-Men are on a mission to Chernaya to take down a fascist uprising that was attempting to overthrow the Chernayan government. After defeating the rebels, the X-Men declare a remote, snowy area of eastern Europe to be the Morlocks’ new home (never mind how the Morlocks feel about it; the X-Men have removed them from their home and deposited them in the forest and, as Cyclops says, “This is Morlock Land now”). At least this book isn’t suffering from decompressed storytelling. There’s non-stop stuff happening in these issues, and it’s so scattered and strange that I have some faith that it’s leading somewhere. Yet at the same time, this weekend Marvel announced that Jonathan Hickman is rebuilding the entire X-Men universe, so it kind of makes me wonder if there’s any point to caring too much about any of this; it’s like we’re just treading water until the real creative force takes over. 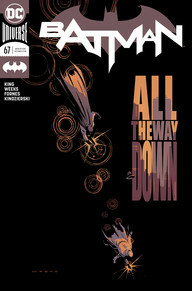 Speaking of treading water, that leads me to Batman #67, with an eye-opening climax taking place in the bottom of the river. I complained last issue that this Knightmare issues are surely interesting parts of a larger story when read together, but they’re not well suited for the serial format. Boy was I seeing the future with that one. This issue is nothing more than an extended chase scene with only the tiniest bits of dialogue. I read it in about two minutes, and that was even with stopping to appreciate it—because this is an absolutely beautiful issue! I’ve actually gone back and re-“read” it a few times, just to admire how stunningly rendered it is. You feel the speed and movement of this issue. It’s incredible. But at the same time I’m like “Get on with it.” There appears to be some kind of revelation at the end, but who knows, because this Knightmare arc is clearly just in Batman’s mind, so the things that appear to be relevant are probably just red herrings, and the things that seem incidental are probably what are actually important. Take, for instance, the Looney Toons references; are we actually going to find some important clue in King & Weeks’ presumably-throwaway Batman / Elmer Fudd crossover from a while back? Or was this just a fun little Easter Egg? It’s impressive, I admire it, but it’s just crying out “Wait for the trade paperback!” on a bi-weekly basis. Speaking of waiting for a trade, that leads me to Guardians of the Galaxy #3, where the Black Watch wants Thanos’ head, but Annihilus has it. There was this big mystery about what happened to Thanos’ head, and then with no fanfare it’s just like “Oh, Annihilus has it.” Hela and Thanos’ Black Watch just show up in the Negative Zone and are like “Hey that’s ours now.” Annihilus doesn’t seem super eager to give it up, but we unfortunately leave this scene with an unresolved cliffhanger. Meanwhile, the Dark Guardians—following the twisted guidance of Starfox—have tracked down Richard Rider and are torturing him to find out where Gamora is hiding. Richard doesn’t break because he’s great! And he escapes because he’s fast! A lot of the last act of this issue has to do with Peter Quill being mopey over the fact that Gamora killed him during Infinity Wars. I actually read that series and somehow I don’t remember that at all. Maybe I didn’t do a very good job of reading it. 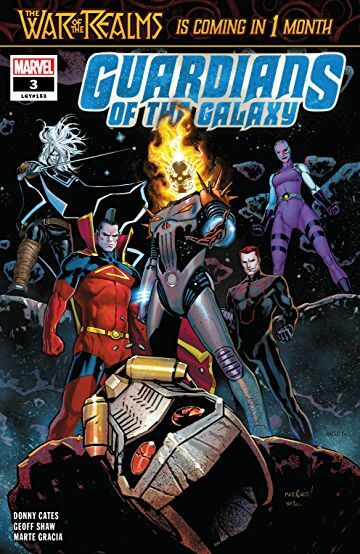 But this act carries on what I’ve been loving so far about this series, and that is a pitch-perfect continuation of the tone that made the Abnett-Lanning Guardians of the Galaxy such an endearing cult favorite last decade. The personalities and interactions in Groot’s mutiny were fantastic, and there’s such a goofily rich cast of characters here too. It looks like this series is going to get sucked into War of the Realms next issue, but I am absolutely looking forward to anywhere this goes. Your reviews this week make me want to actually pick up a few of these – well, just Guardians and Batman, actually. I think I’ll do that. I’ll let you know if I follow through.